Purely and uniquely Goto, our wines are made, from the grapes to the bottling, 100% in Goto. Enjoy the smell and taste of Goto, through our wines that can only be had here. 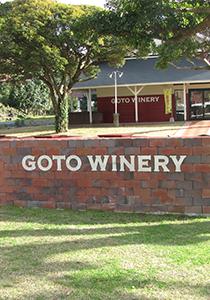 On the resort grounds, we have our own private winery called Goto Winery. Here we make our own wines. Everything is made here on the island. The grapes used to make the wines are all cultivated here, and the winemaking is done on-site as well. 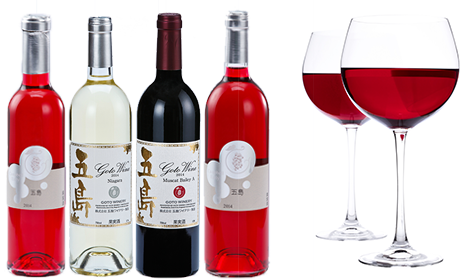 Goto Winery's wines are also available for purchase online. The beautiful red color of our wines will remind you of the beautiful red camellia flowers that grow in Goto. Our florid rose colored wines will deliver a fresh and dry taste for you to enjoy. The labels on our wines are supposed to be reminescent of the church bells that Goto is famous for. This is a good way to enjoy your trip to the island. The heart and soul of the island, its land and its people are lovingly, and meticulously brought to you in each bottle. Below you will find a link to the winery's online shop.